A community-centered blended learning platform that equips mothers to re-enter the workforce through tech skills training. TechMoms is accessible to audiences outside of major cities, and prepares students for freelance and full-time work. Our challenge was to create a platform that motivates sustained learning outside of traditional K-12 or higher education, drawing upon Duolingo as a case study. We were given the option of designing for one of the following audiences: parents re-entering the workforce, coal miners hoping to transition careers, and veterans. TechMoms is a blended learning platform that equips mothers re-entering the workforce with skills that allow them to be competitive in our digital knowledge economy, such as coding, front-end web development, UX design, marketing & branding. Moms living in smaller cities or rural areas. While design and coding bootcamps are becoming increasingly ubiquitous in large cities such as San Francisco and New York, they are inaccessible for those living in other areas. Given the large divide between urban and rural communities in regards to income and access to opportunities, we thought it was important to design for this audience. Another key feature of TechMoms is that it prepares students for freelance work, which could be attractive for working mothers desiring flexibility in their schedules. TechMoms was designed in the span of one week in February 2017 for the course Designing for Desirability at the Harvard Graduate School of Design. The User Journey Map gives an overview of the content and structure for a UX design course. Most courses are 4 months long and are part-time. The last three weeks in the program are dedicated to an internship with an industry partner. The User Journey includes visuals for the type of work students are able to produce as a result of the training they receive each month. Post-graduation, students continue to have access to resources such as job support, mentorship, and the ability to attend additional workshops at a discounted rate. Because the tech world is constantly changing, TechMoms hopes to instill a drive for lifelong learning among its students. Students will attend one remote course with their instructor and classmates once per week, for 1.5 hours. The instructor will be able to utilize media such as presentations, videos, interactive whiteboards, etc. Students will attend one-on-one remote meetings with their mentors every 2 weeks. These sessions offer a chance for students to gain individualized advice on their strengths and weaknesses, job search tips, and so on. Students will also attend a biweekly guided meetup with other moms within geographic proximity. The instructor will be on standby if the students have any questions, but these sessions are mostly an opportunity for the mothers to build a community of support as they work on individual projects. Students have the option of attending a professional development conference in SF, NY, Boston, & Chicago -- a chance to network with innovative companies and other women making a splash in the tech world. The instructors are industry experts in the tech and design world. They might work at companies like Facebook and LinkedIn. While the instructors are paid generously for their work, they are also motivated to work for TechMoms in order to attract freelance talent for their companies, to contribute to the mission of increasing the numbers of women in tech industries, and as a service to create greater access to opportunities in smaller cities and rural communities. Our multimedia platform maximizes the potential of blended learning, as outlined in the Life Sciences Education journal here. 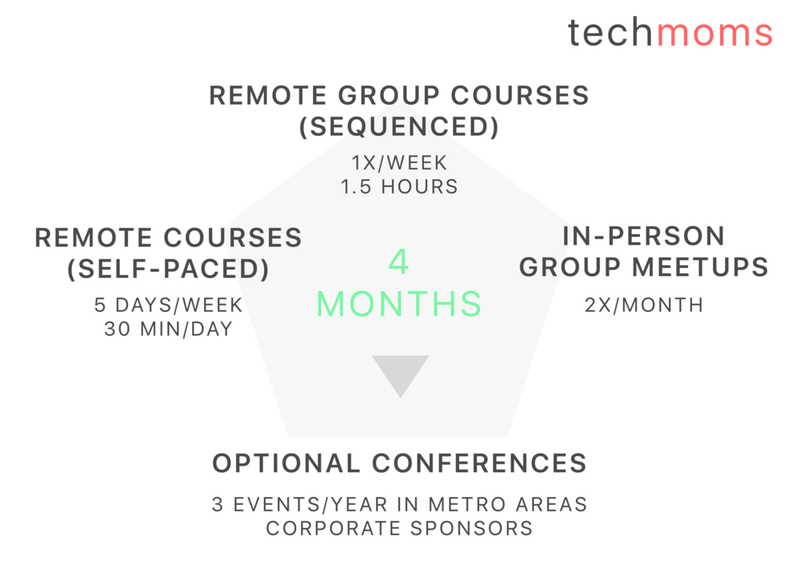 The mentorship and in-person community components of TechMoms is aligned with research from the Marketing Education Review indicating that students view traditional classes as more effective due to factors such as face-to-face communication and collaboration. On-demand learning: our courses are flexible and immediately accessible. The platform is centered on online modules followed by an immersive, in-person series of community events. Competency-based model: students advance by mastering concepts, not on time-based measures such as credit hours. This allows us to personalize learning for students and to create programs that align with what employers need. This model is also easier to measure and iteratively improve upon than traditional time-based programs. Career services: Instructors and mentors are leaders in the tech industry, and students have access to them after the program ends. Project-based learning and internships are integral components of TechMoms, which is similar in strategy to tech bootcamps that boast high job placement rates and starting salaries for graduates. Together, these strategies will hold students socially accountable and thus motivate them to keep persisting through the program. Since we only had a week to produce our product concept, Catherine and I quickly brainstormed ideas for the platform, which you can see below, and rapidly mocked up the user journey as well as visuals for the homepage. One piece of feedback we received was that there should be a system of support in case motivation in a community lags, especially in rural areas. For instance, TechMoms might train a member of the local community to act as a teaching assistant or 'community champion' to ensure that motivation remains high and that students receive in-person mentorship in addition to remote mentorship from an industry expert. Icons modified from designs by Freepik.